Download "B. 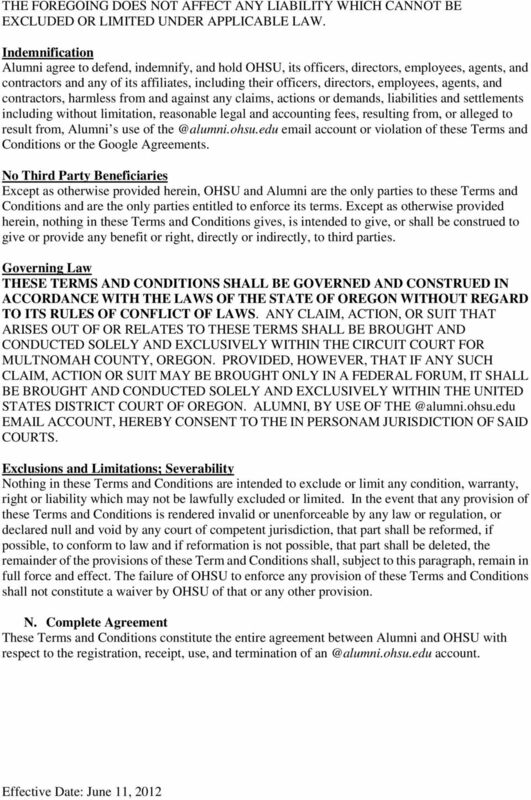 Terms of Agreement; Google Terms of Service; Conflicting Provisions"
5 or any of OHSU s affiliates for any purpose, including, but not limited to, any press release, general publication, advertising, marketing, promotional or sales literature. M. General Terms and Conditions THE USE OF ACCOUNT IS SOLELY AT THE RISK OF THE REGISTERED USER. Disclaimer of Warranties OHSU IS PROVIDING AS IS AND ON AN AS-AVAILABLE BASIS. NEITHER OHSU NOR ANY PERSON OR ENTITY ASSOCIATED WITH OHSU MAKES ANY REPRESENTATION OR WARRANTY WITH RESPECT TO THE COMPLETENESS, SECURITY, RELIABILITY, QUALITY, ACCURACY OR AVAILABILITY OF THE ACCOUNT WEBSITE OR THE SERVICE. WITHOUT LIMITING THE FOREGOING, NEITHER OHSU NOR ANY PERSON OR ENTITY ASSOCIATED WITH OHSU REPRESENTS OR WARRANTS THAT THE ACCOUNT WEBSITE, ITS CONTENT, OR SERVICES OR ITEMS OBTAINED THROUGH THE WEBSITE WILL BE ACCURATE, RELIABLE, ERROR-FREE OR UNINTERRUPTED, THAT DEFECTS WILL BE CORRECTED, THAT THE SITE OR THE SERVER THAT MAKES IT AVAILABLE ARE FREE OF VIRUSES OR OTHER HARMFUL COMPONENTS OR THAT THE WEBSITE OR ANY SERVICES OR ITEMS OBTAINED THROUGH THE WEBSITE WILL OTHERWISE MEET YOUR NEEDS OR EXPECTATIONS. OHSU AND ANY PERSON OR ENTITY ASSOCIATED WITH OHSU EXPRESSLY DISCLAIM ALL WARRANTIES OF ANY KIND, EXPRESS OR IMPLIED, INCLUDING WITHOUT LIMITATION THE WARRANTIES OF MERCHANTABILITY, FITNESS FOR A PARTICULAR PURPOSE, AND NON-INFRINGEMENT. THE FOREGOING DOES NOT AFFECT ANY WARRANTIES WHICH CANNOT BE EXCLUDED OR LIMITED UNDER APPLICABLE LAW. 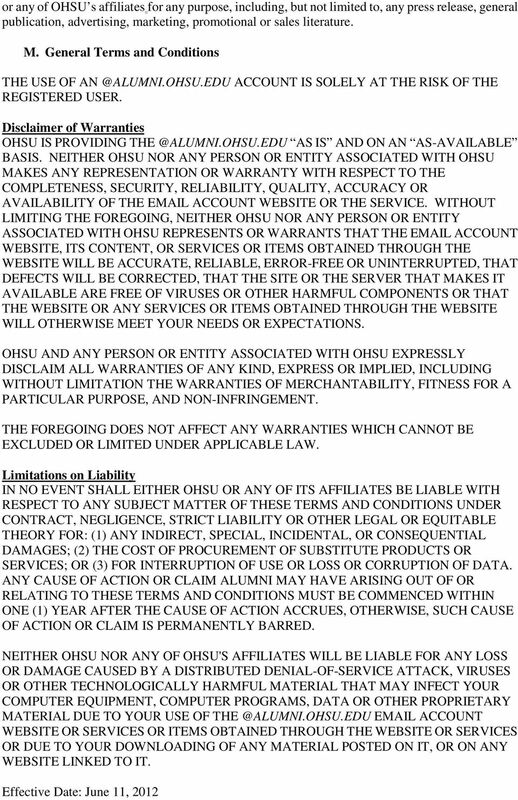 Limitations on Liability IN NO EVENT SHALL EITHER OHSU OR ANY OF ITS AFFILIATES BE LIABLE WITH RESPECT TO ANY SUBJECT MATTER OF THESE TERMS AND CONDITIONS UNDER CONTRACT, NEGLIGENCE, STRICT LIABILITY OR OTHER LEGAL OR EQUITABLE THEORY FOR: (1) ANY INDIRECT, SPECIAL, INCIDENTAL, OR CONSEQUENTIAL DAMAGES; (2) THE COST OF PROCUREMENT OF SUBSTITUTE PRODUCTS OR SERVICES; OR (3) FOR INTERRUPTION OF USE OR LOSS OR CORRUPTION OF DATA. ANY CAUSE OF ACTION OR CLAIM ALUMNI MAY HAVE ARISING OUT OF OR RELATING TO THESE TERMS AND CONDITIONS MUST BE COMMENCED WITHIN ONE (1) YEAR AFTER THE CAUSE OF ACTION ACCRUES, OTHERWISE, SUCH CAUSE OF ACTION OR CLAIM IS PERMANENTLY BARRED. NEITHER OHSU NOR ANY OF OHSU'S AFFILIATES WILL BE LIABLE FOR ANY LOSS OR DAMAGE CAUSED BY A DISTRIBUTED DENIAL-OF-SERVICE ATTACK, VIRUSES OR OTHER TECHNOLOGICALLY HARMFUL MATERIAL THAT MAY INFECT YOUR COMPUTER EQUIPMENT, COMPUTER PROGRAMS, DATA OR OTHER PROPRIETARY MATERIAL DUE TO YOUR USE OF ACCOUNT WEBSITE OR SERVICES OR ITEMS OBTAINED THROUGH THE WEBSITE OR SERVICES OR DUE TO YOUR DOWNLOADING OF ANY MATERIAL POSTED ON IT, OR ON ANY WEBSITE LINKED TO IT. 6 THE FOREGOING DOES NOT AFFECT ANY LIABILITY WHICH CANNOT BE EXCLUDED OR LIMITED UNDER APPLICABLE LAW. Indemnification Alumni agree to defend, indemnify, and hold OHSU, its officers, directors, employees, agents, and contractors and any of its affiliates, including their officers, directors, employees, agents, and contractors, harmless from and against any claims, actions or demands, liabilities and settlements including without limitation, reasonable legal and accounting fees, resulting from, or alleged to result from, Alumni s use of account or violation of these Terms and Conditions or the Google Agreements. No Third Party Beneficiaries Except as otherwise provided herein, OHSU and Alumni are the only parties to these Terms and Conditions and are the only parties entitled to enforce its terms. Except as otherwise provided herein, nothing in these Terms and Conditions gives, is intended to give, or shall be construed to give or provide any benefit or right, directly or indirectly, to third parties. Governing Law THESE TERMS AND CONDITIONS SHALL BE GOVERNED AND CONSTRUED IN ACCORDANCE WITH THE LAWS OF THE STATE OF OREGON WITHOUT REGARD TO ITS RULES OF CONFLICT OF LAWS. ANY CLAIM, ACTION, OR SUIT THAT ARISES OUT OF OR RELATES TO THESE TERMS SHALL BE BROUGHT AND CONDUCTED SOLELY AND EXCLUSIVELY WITHIN THE CIRCUIT COURT FOR MULTNOMAH COUNTY, OREGON. PROVIDED, HOWEVER, THAT IF ANY SUCH CLAIM, ACTION OR SUIT MAY BE BROUGHT ONLY IN A FEDERAL FORUM, IT SHALL BE BROUGHT AND CONDUCTED SOLELY AND EXCLUSIVELY WITHIN THE UNITED STATES DISTRICT COURT OF OREGON. ALUMNI, BY USE OF ACCOUNT, HEREBY CONSENT TO THE IN PERSONAM JURISDICTION OF SAID COURTS. Exclusions and Limitations; Severability Nothing in these Terms and Conditions are intended to exclude or limit any condition, warranty, right or liability which may not be lawfully excluded or limited. In the event that any provision of these Terms and Conditions is rendered invalid or unenforceable by any law or regulation, or declared null and void by any court of competent jurisdiction, that part shall be reformed, if possible, to conform to law and if reformation is not possible, that part shall be deleted, the remainder of the provisions of these Term and Conditions shall, subject to this paragraph, remain in full force and effect. The failure of OHSU to enforce any provision of these Terms and Conditions shall not constitute a waiver by OHSU of that or any other provision. 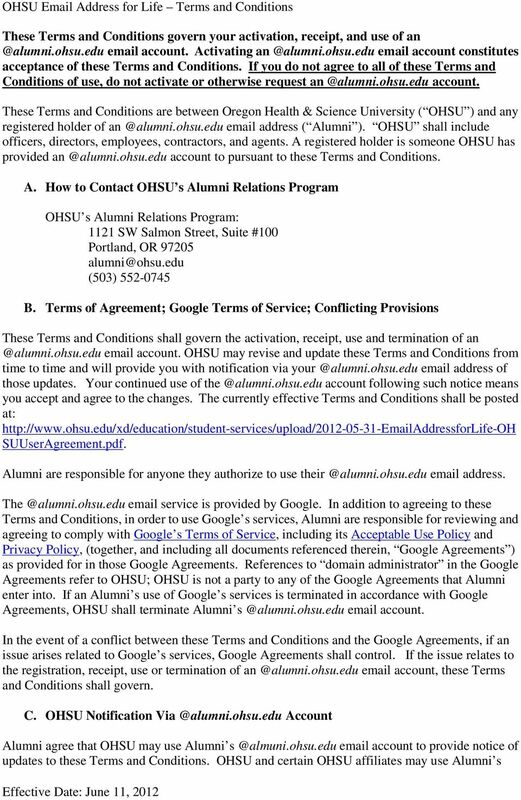 N. Complete Agreement These Terms and Conditions constitute the entire agreement between Alumni and OHSU with respect to the registration, receipt, use, and termination of account. Online Back-Up, Off-Site Back-Up, Restore Service of Back-Up. cosmeticsurgerycounselling.com is owned and operated by Cosmeticsupport.com, operating as a private agency. This information archive and support site is therefore governed under the laws of UK, the EU. !